Multi Transient enables you to tweak each band independently. Audio Assault released its free Transient envelope shaper plugin earlier this month, but it turns out that this was merely an hors d'oeuvre. The company has now released Multi Transient, a multi-band envelope shaper that gives you far more tone-shaping control. This enables you to control the attack and sustain for each band (Bass, Low Mids, High Mids and Treble) and also the master output. Multi Transient is said to be the perfect tool for shaping your drum sound, and if the standard settings aren't doing it for you, you can double the intensity of the effect with the 2x button. 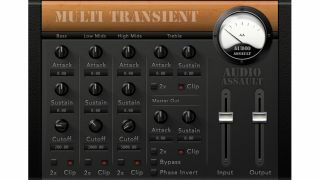 You can buy Multi Transient now from the Audio Assault website for $29.99 (this is for the personal/small business license). It's available in VST/AU/RTAS/AAX formats for PC and Mac, and there's also a demo to download.